The option that seems most convenient at first is not always the best. Quite the opposite, in fact. 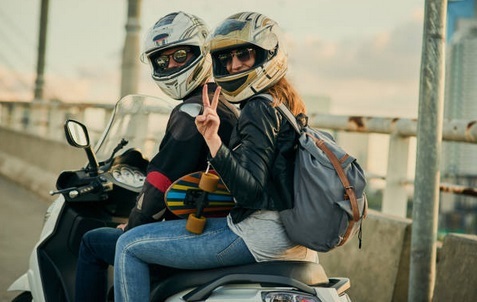 When you need a prescription and wear glasses while riding your motorcycle, you may think that the easiest choice for you is simply finding fit over glasses that add extra protection against the sun and road. But while that might be the easiest choice, it’s far from the best. There are a variety of reasons why riders tend to choose fit over glasses. All of them are certainly legitimate considerations. But once you examine them further, you realize that following this trend could be a considerable mistake. Keep reading for an overview of the benefits of fit over glasses, and why you might need an alternative instead. Make no mistake: fit over glasses do not cost much. In fact, that might just be the single most quoted benefit you will find from this type of solution. You will be able to buy fit over options that add UV protection or shade from the sun for as little as $5. Quality aside, this is an undeniable benefit at first sight. We all have tight wallets and need to be sure that we spend our money wisely. At first sight, fit over glasses offer the perfect opportunity to do just that. And yet, they might still not be worth the investment. After all, glasses are just that: not a cost, but an investment into your comfort and safety. Simply fitting lenses over your existing prescription glasses may be cheap, but they also won’t get you much in return. For instance, they are uncomfortable. As a result, you may not be wearing them much as you take your bike for a ride. That, of course, minimizes their benefit in this area. In addition, fit over glasses can actually damage your regular glasses, making them more expensive than you might think at first glance. You can buy fit over glasses anywhere. Even regular grocery stores often carry at least some options. If you want to get more specialized and get motorcycle goggles, you can find them anywhere online and in a variety of specialty shops. Compare that with prescription motorcycle glasses, who require a specific order that includes your prescription every time you need them. One alternative is undeniably more convenient than the other, which is why so many people choose the fit over option. But don’t underestimate the benefits of specialization. Yes, each time you need a new pair of prescription goggles or glasses, you need to place that order yourself and pay the price. But that order also comes with significant benefits that you simply cannot overlook, and that set it apart from a cheap fit over alternative. Specialized glasses are more convenient. You will never forget them anywhere, they fit your head better, and they’re more attractive to anyone looking at you as you go on a ride. Compare that with fit over glasses, who cannot score in any of these criteria. Yes, you have to special order. But that special order will be well worth your time and investment. Finally, and in part a combination of both of the above benefits, you will often hear that the low price and high convenience of buying fit over glasses enables you to get as many pairs as you want. That in turn, is supposed to significantly increase the convenience of this buying option. And again, it makes sense at first sight. You can get UV protection, anti-glare, and sunglass pairs that you can switch out depending on your need that given day. But, when you really think about that, is it really still convenience? What if You Could Get a Multi-Functional Prescription Pair? Let’s consider true convenience in this area for a minute. It means a single pair, which functions in all situations, designed to help you regardless of weather and road conditions. That is, at its core, what any pair of glasses should accomplish. But simply, fit over glasses cannot. You can, however, get a multi-functional pair of prescription motorcycle lenses that does. Various coatings, from anti-glare to UV protection, help you protect your eyes and keep your vision clear. Meanwhile, transition lenses automatically become sunglasses when the light gets too bright. In short, every benefit of fit over glasses is mitigated by an even more significant advantage of prescription glass alternatives. The result is simple: at first sight, fit over glasses might make sense. But the longer you consider them, the more you realize that your first glance probably doesn’t provide the whole picture. That’s especially clear once you consider the benefits of prescription motorcycle glasses. You only need a single pair regardless of the situation, with your exact prescription baked in for clear vision. You can pick the style and frame you need, without having to worry about finding a fit over pair that matches it. In short, prescription glasses and goggles come out ahead in every major metric and situation. Given all of these benefits and points, one thing is clear: you should not get fit over motorcycle glasses if you can at all prevent it. They might seem quick and convenient at first, but sacrifice in multiple areas from comfort to safety that you do not want to compromise on. Instead, prescription motorcycle glasses are a much better choice. Of course, you still have to find a pair of prescription glasses that suits your need. That means choosing between regular glasses, sunglasses, and goggles. Look for an online merchant that allows you to choose from all of these alternatives so you can find a pair that’s perfect for you. When you go down this route, you might pay more initially, but that will come with significant return on investment on both your safety and your enjoyment of the next big ride.